A large number of people suffer from debilitating conditions that may keep them in bed for a long time. Statistics show that diseases, mostly non-communicable ones, are on the rise. In the future, a large proportion of individuals will suffer from conditions that are difficult to treat, and which will require lifetime treatment. One of the side effects of this is declining physical health, in which the individual finds themselves bedridden. People who are bedridden or who need comfortable beds for orthopedic and other purposes will find air beds to be quite helpful. At Airtech Vacuum Incorporated, we carry a wide range of vacuum and pressure technologies that is suited for the air bed pumps industry. There is a growing demand for air beds to perform more functions in a certain way. In the air bed pump industry, there is a lot of pressure to ensure that the pumps are made to suit the demanding needs of hospitals, healthcare facilities, and individual clients. It is common to find some parties requiring one type of air bed to serve different purposes. For instance, they might want it to act as a regular bed, orthopedic bed which places pressure on specific points of the body, or a bed that prevents bed sores by changing pressure points on the body in a regular manner. In a nutshell, the air bed pump that provides the right amounts of air and pressure to the different areas of the bed and which is also reliable is the one that will sell the most. Why Choose Airtech Vacuum Incorporated for Air Bed Pumps? Airtech Vacuum Incorporated is an accredited manufacturer of a huge range of pressure and vacuum technologies. 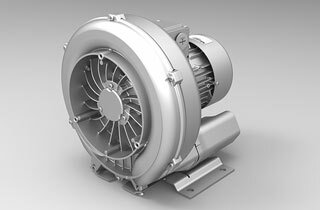 In addition to our blowers, we also manufacture vacuum pumps and regenerative blowers. Airtech Vacuum Incorporated has also attained multiple certifications including RoHS, CSA, UL, ISO, and more. This guarantees that our customers will have access to products that are designed and manufactured to exceed stringent standards. In addition to excellent credentials, a huge customer base of satisfied clients is also a sign that our methods and practices work to ensure that all our products exceed all expected standards, which is one of the key goals of our venture. Start browsing our inventory for high quality air bed pumps industry blowers today and shop with confidence!